OMAHA: CULTURAL DIVERSITY AND BIG-CITY BENEFITS WITH A MIDWESTERN HEART. Diverse economy. Affordable housing. Big city amenities. Opportunities are everywhere in Omaha – in health care and beyond – making it an ideal place to live, study and work. 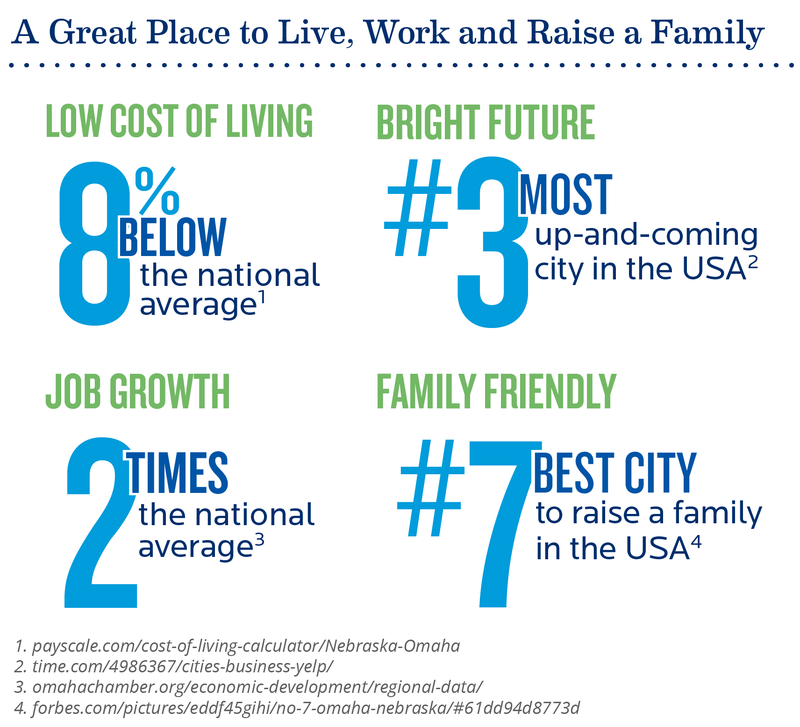 Recently ranked #28 in U.S. News’ list of the Best Places to Live in the United States, Omaha’s cost of living is significantly lower than other metropolitan areas around the country. It’s convenient, too. Most everything in the city—including the airport—is a short drive from Creighton’s campus, accessible in less than 20 minutes by car. Omaha combines big city convenience with a small town feel, and has the amenities to fit. A thriving food scene supported by some of the nation’s best local produce. A long list of excellent public and private schools throughout the city. Three entertainment districts, all within close proximity of Creighton. Great people. World-class healthcare. No matter what you’re looking for, you’ll find it here in Omaha. Omaha is home to one of the world’s leading medical communities, and Creighton is at its center. We offer training opportunities in cutting-edge facilities and one of the nation’s best teaching hospitals. As a result, students in the School of Pharmacy and Health Professions are well positioned for success across a wide variety of career paths. You’ll also find many of our students working and serving in and around the Omaha community; they routinely staff free clinics for the underserved, conduct education seminars and volunteer with community partners. That’s part of why, at Creighton, you have the opportunity to be so much more than simply a student. Creighton is an experience you’ll carry with you for the rest of your life into your career, your community and the world. Learn more about how you can thrive personally and professionally in Omaha.